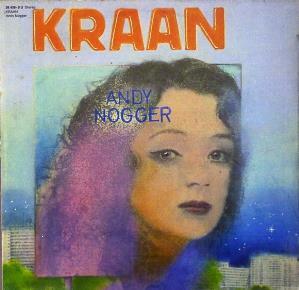 Kraan were ready to face the challenge and work on an even more professional level by 1974, as the band was hitting the road in Germany for countless gigs.Their next work ''Andy Nogger'' was now recorded at the studio of experienced sound engineer Cony Planck near Cologne.The album was originally released on Spiegelei in 1974, but it was also the first one to reach the markets of the States and the Islands, released in 1975 on Passport Records and Gull respectively. Planck was supposed to do only good to an already mature band with his professional background, but the truth is that this one sounds like the less convincing album of the original Kraan quartet.Blame it mostly on the rising edges of Funk throughout, as the strong psychedelic and Ethnic component of Kraan's music somewhat starts to fade and the same goes for the Kraut Rock character of the band, although facts say they still performed plenty of jamming improvisations during their lives. ''Andy Nogger'' sounds like a pretty standard Jazz Rock/Fusion effort at the very end and the presence of the intense rhythmic patterns of the Kraut Rock movement is what still sets them apart from other acts of the time.The music is now a funky-oriented Fusion with less sharp sax lines and almost zero ethnic orientations, basically structured around furious grooves, intense bass lines, solid drumming and the occasional sax parts, delivering plenty of rockin' tunes, while the listener searches for some good old Kraan experimentation in the album. ''Holiday am Marterhorn'' maybe offers such an attitude, being stylistically closer to the dramatic Kraut Fusion of the previous albums with great sax work by Johannes Pappert, but it's propably the production that make it sound a bit sterile at the end.However Kraan still play some quite tight and energetic music in ''Andy Nogger'' with good interplays, flaming rhythms and jazzy soloing. A bit on the safer side of Kraut Fusion, lacking the intricate and deeply psychedelic moments of ''Kraan'' or ''Wintrup''.Bear in mind that this comes close to a standard Jazz Rock/Fusion effort, still carrying the Kraan identity, and chances to like it will increase.Recommended.